Today I only had half a day of training and tomorrow (Sunday) I get the whole day off, then Monday and Tuesday is training and Wednesday I finally get to go to my school in Nagasaki and meet the other teachers!! I can't believe it's already been a week since I've arrived in Japan! All the more reason to come up to Tokyo and see me!!! Or send me a list and the next time I'm there (nearly every weekend >____>) I can see what I can do for ya. Glad you're enjoying yourself so far. 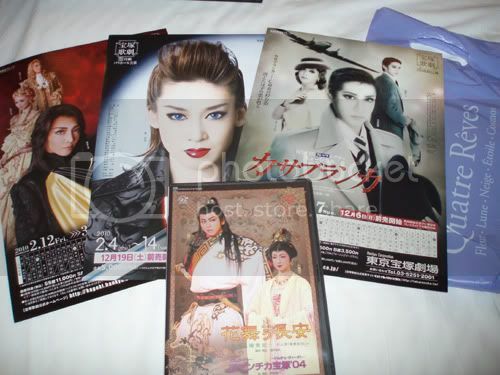 Reminds me when I used one of the only 2 free days I had in Japan to go to Takarazuka. The QR in the theatre was killing me, since I knew that I can buy my dreamy Ernest in Love DVD with Sena and Kiriyan and the AQUA5 CD staring at me provocatively and I am pretty much done for (>.<). If I had more money I would have so loved to clear half the shelves there.